8.22 points at 67 votes (rank 50). In Paradroid you have to clean a ship fleet from hostile robots. For this you control an influence device of the series (001), which can connect to other robots, to control them after a successful takeover. This is really necessary as the (001) series is only equipped with a weak laser and a low protection shield. Unfortunately, the circuits of each "host robot" get damaged by the external control, the higher developed the robot, the bigger is the damage. 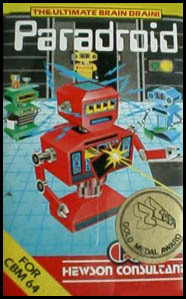 The task of the player is to eliminate the hostile robots on 16 decks per ship, either by taking them over or by the use of a weapon. There are altogether 24 robot types in 10 classes. The gameplay itself on the individual decks is displayed from the birds view with a mobile and fast scrolling. Additionally there are static information screens and transfer sequences. The sound is largely limited to coherent effects. In the static screens choose with the corresponding direction and confirm by pressing fire. At the start of the transfer you can choose which side of the controls you want to have (left is yellow, right is purple), thereby you should look for continuous conducts, recolouring mechanisms and repeaters. Furthermore there are conducts, which reach several fields by y junctions with one energy capsule or need several energy capsules for activation due to the joining of conducts. After the time has run out or confirming by pressing fire the actual transfer takes place. The aim is to have more than 6 fields in your own colour at the end of the process. If a draw is reached (both have 6 fields), then the transfer is repeated with a new circuit diagram. If you have less than 6 fields, the hostile robot overcharges the influence unit and the previous host gets lost. If there was no host robot before the transfer, the 001-device explodes and the game is over. The higher the serial number, the more energy capsules has the corresponding robot and the energy capsules only last for a limited time, unless a circuit with a repeater was activated. When both sides try to activate the same field, it will -at the end of the transfer- have the colour which was activated at a later point or the one with a repeater in the circuit. You can control robots with a lower number longer than the ones with a higher number. Especially when you have the 999, you should be prepared to change the host very soon. On recharching fields, the robots can be regenerated to their maximum energy (which declines with time) against the subtraction of points. Only the 001 doesn't lose maximum energy, it can always be recharged fully. 500s and 600s are very useful for exploration, the smaller robots can be shot with them and the bigger should preferably get withdrawn from service by taking over. Higher robtos cause damage when colliding with lower robots. Especially when you control the 001, you should be carful not to get between two higher robots. If you control a 711 or a 742, you can ram the robots which are immune against your weapon (especially the 420s) until they are destroyed. If you drive through explosions, you lose energy. If you destroy many robots in a short time, the alarm display changes from green to yellow and red respectively. During this tim you get extra points for robots destroyed or taken over. As long as you aren't proficient in the transfer 100%, you should only take over robots that are 2 categories higher than you, i.e. from the 001 to 200s, then 400 and with this a 600. You should place your energy capsules as late as possible and concentrate on conducts which are connected to several fields. When transfering robots with middle numbers, you should allocate the enemy the side, which has the most colour changers and dead ends. Colour the "secure" fields first and then the recoloured fields from the enemy. Deck 1, 2, 13 and 14 contain several divided sections. They count as done (get grey), when 'all sections of the deck are free of robots. On some decks there are several lifts. The ones, which are further left on the map, are on the deck further in the west. First train the transfer of smaller robots on decks 4-6 and memorise the position of the lifts on these decks. Then you can go on with decks 7, 9 and 10, to get to the points in a rather secure way. On each stardeck take over a small robot (100/200), change to deck 6 and take control of a 400, with this get a 600 or a 700 on deck 10 and change to deck 12. Carefully cross deck 12 on the upper side to get to the other lift, on the way destroy all 100s and 300s and take over the 700s and 800s. When deck 12 is empty, deck 11 is next. There you'd better stay only on the left and upper corridor, until hardly any robots are on the deck. Then clean the rest of the deck. Now you can fully clean deck 10 and change to deck 9 via deck 6. From there clean the "edge decks" of deck 13 and 14 (below deck 9), so the cleaning of the main decks 13 and 14 is display by the grey colour. After that the rest of the decks can be cleaned rather safely. Load the game as usual by Load"*",8 then enter the following poke: Poke 8410,0 and start with run. From now on you will win every transfer easily. Pascal Ciampi: "Another game which is so fantastic, that the graphic gets a minor matter. The idea of the game alone is brilliant. The implementation is impressively clear and simple. Worf 22:20, 16. Sep 2005 (CEST): "I have a different view. I was fascinated particularly by the graphics and the nice shades. When the last robot of a deck was eliminated or taken over, the sound of electro motors shutting down slowly, the light goes out, only some functional lamps still glare like LEDs in the dark. The colours of the design change from time to time, everything in nice harmonised colours. The idea of the game is also very good. This is altogether a good game!" Borna: You should not disregard the fantastic droid graphics, let alone the excellent game principle. A consens classic, which every C64 user should have known and which is fully justifiable at the top of the charts. Outstanding! Equinoxe: "How many hours I have spent with this game! Functional graphics with a brilliant game principle. I played through the aisles night after night. It was only a bit deflating when I first made it to clean the first ship and the game continued on an identical second ship. Unfortunately, I never made it to clean all the ships, although by and by you are practically able (with a bit of luck) to take over every robot without a problem (what a feeling when you took over an 883 with your already flashing and shot-down 001-unit). I almost solely steered with the fire button pressed in permanent take-over mode through the game ... which was sometimes a bit annoying, when you ran into the wrong robot in the levels, where next to the 700s and 800s also 200s were running around. 10 points from me." There were several versions of Paradroid released: An original version, a Competition Edition and a Heavy Metal Edition. The game is also included in the C64DTV. The Competition Edition is primarily considerably faster and more fluent than the original version, the Metal Edition offers also an additional graphics style. Both versions should be preferred to the original version, but altogether much better is the Redux version (see Links). On the Redux homepage And in the corresponding blog you can find next to the current download (new version: 22.08.2010) also many technical background information and description of the differences in the versions. Since 23.05.2008 the game is available for Nintendo Wii as Virtual Console title for 500 Wii points (about 5 EUR). The Paradroid ships are named: Paradroid, Metahawk, Hewstromo, Graftgold, Blabgorius IV, Red Barchetta, Retta-beast, Itsnotardenuff. The 883 droid looks like a Dalek, and is said to inspire terror in humans for some unknown reason. For all Paradroid fans, who like a faster and more fluent gameplay, there is the PARADROID REDUX version by TNT/Beyond Force, a brushed up version of the classic. Hardly shaking or slowing down when there is a lot going on. Additional "statistics" Option at the consoles. Intelligent droids, that depending on the rank difference react different to the player and even look for it! Radar option, when you occupy a high level droid: stand still for 3 seconds, when there is no enemy in the room/field of vision. A lamp on the own droid will appear that shows direction and degree of danger of the next droid. This page was last modified on 10 February 2017, at 22:52. This page has been accessed 23,865 times.